Since I’ve started my solo travels in 2014, I’ve always been on the receiving end of the kindness of strangers. And today, I experienced kindness in full circle. Onboard the ferry from Puerto Galera back to Manila, I met a German woman on her own and on her way to the airport. In my head, at her age she should have at least a companion. Small talk soon ensued and I found out she has one, but opted to stay behind while she decided to head back to Munich because she had a minor accident and won’t be able to swim anyway. Commuting from the countryside to the airport is not convenient. Not at all. Possibly two transfers: bus and then cab. And in her case, it’s extra difficult because of her luggage and stature: she’s a foreigner. And I don’t want her to be taken advantage of and leave the Philippines with this kind of memory. Just a few minutes away from the Batangas Port. True enough, as soon as she stepped from the ferry, there were portmen hounding her get a private van for Php3500 (Eur65). I just had to step in and took it upon myself to haggle for her and brought it down to Php2500. With her condition, she’s better off in a private van and I told her we can share so I can make sure she gets to the airport safe. But she won’t have it and offered I ride with her. And while on our way, I asked her what can I do for her. I told her, we can call her husband on Skype or WhatsApp but she said he’ll still be asleep. All she asked instead was that I check if there’s a Saudia flight today for her connecting flight to Jeddah for Munich. Some three hours later, we arrived at the airport and Edda and I hugged each other goodbye. The driver turned out to be a nice fellow and dropped me off at a train station. So I got back to Manila for free because today, kindness reaped kindness. Sweet. Have a safe flight, Edda. Godspeed. 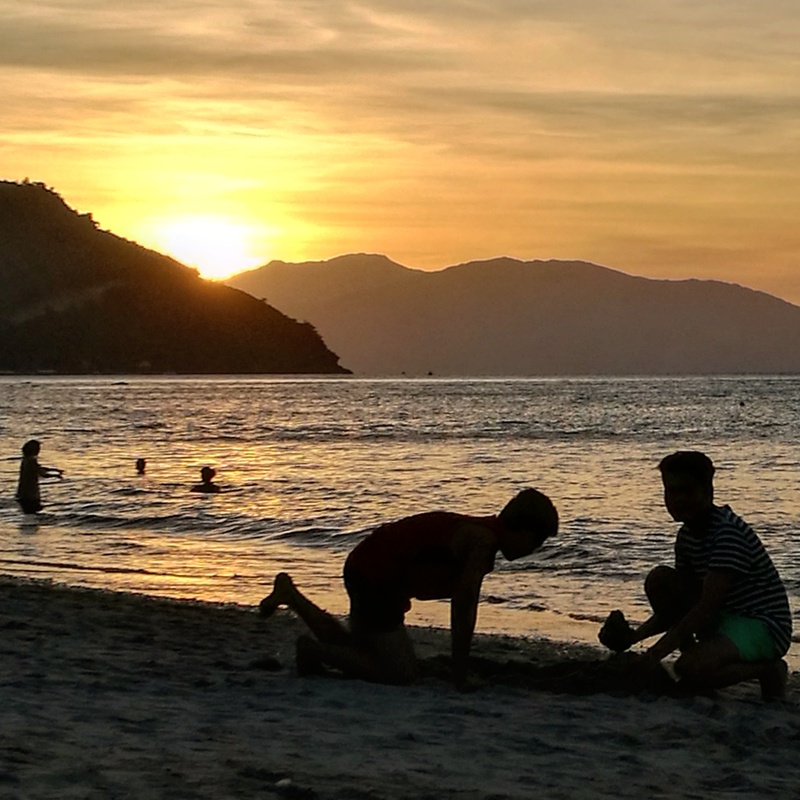 Father and son trying to build a little sand castle at sunset.